He's the sacrificial lamb. When Nelson grants the JOA, the story will be that Mantei messed up the argument. George started the fight? 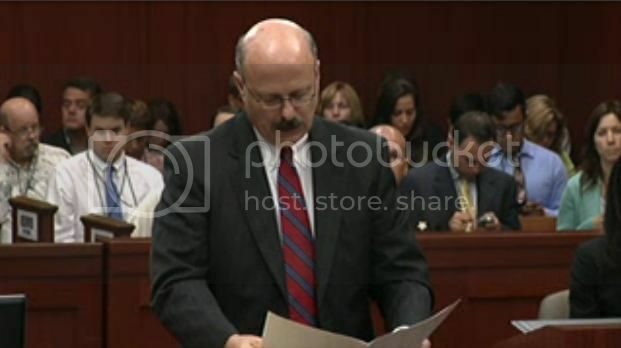 There are no marks on Trayvon, and RJ testified that Trayvon confronted George. Where is the evidence that George started it? Who needs evidence when you have "judicial discretion"? Many don't believe the judge wants the responsibility or the backlash for ending this case now. She may surprise us, but she hasn't yet. Well, not in a big way like granting a JOA. I'm always surprised those rare times she sustains a defense objection or overrules the state. I'm in a debate with a traybot. Early this am on CTH I saw a media release about a meeting to be held on Tues July 9th to discuss the verdict in Sanford. Now I can't find it over there. Protip: follow CTH, so that you get email notification of all new posts. Makes it easier to find old posts. From all the evidence presented in this case, I don't think there was even a fight. It was a beating. I don't think George ever had a chance to even get a blow in. 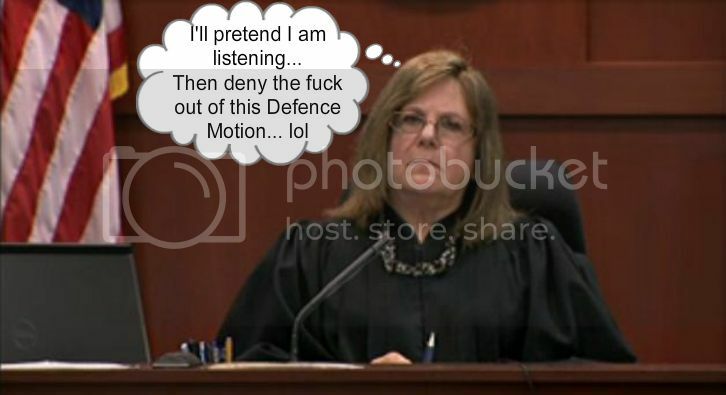 I think the defense has proven that beyond a reasonable doubt. Oh wait... it was the state's case... so the state proved it beyond a reasonable doubt through the witnesses they called. Weasel boy is a pathological liar, this argument is proof of such. He should be forced to sleep with Nelson and Corey for a month.......at the same time!!!!!! Start a change.org petition if Rumpole won't order it! I love you...want to go steady? Can anyone imagine having a romantic encounter with any of the state prosecutors? Cripes even Guy has a sinister sneer. Bet he is in to pleasing himself and not the partner. LMAO!!!!! MoM just blew away LIMPapa's argument on GZ pulling on the hoodie when he shot TM. O’Mara says he never got the chance to tell Martin he was with neighborhood watch because he was punched first. “Show me how you have proven that there is no reasonable hypothesis of innocence,” O’Mara says. O’Mara says there’s no evidence to support that. He says common sense should not be ignored in a judgment of acquittal. “Yes he shot him, there’s no question about that,” O’Mara says, but adds there is no direct evidence of ill-will. He says there’s no evidence that at the time he shot he was the initial aggressor. The real focus is at the time of the shot if his fear was of great bodily injury. “All he knew was that Trayvon Martin wasn’t stopping the attack after 40 seconds of screaming,” O’Mara says. “Trayvon Martin sucker punched my client,” O’Mara says. He says his client waited an additional 40 seconds before taking action to stop the attack. O’Mara says the Leisure case had three different stories to 911. He says the facts of the Zimmerman case are much different. O’Mara points out the non-emergency call. He says they want the judge to take the beginnings of ill-will. He says Serino and Singleton testified that they were changes they expected, about the inconsistencies from Zimmerman. It’s merely what happens when someone has been through two traumatic events. O’Mara says the totality of the circumstances must be considered. He says the state should give him credit one way or the other, but the reality is he went through a traumatic time and is dealing with it just like the Martins. O’Mara says the testimony of Mora and Surdyka said nothing about pursuit. Wasn't most of what he said disputed by their own witnesses? Closer to all of it, imo. I can't remember anything at all that wasn't. Oh look: Nelson speed-reading from a pre-determined decision denying the JOA. I don't think my wife would take too kindly to that. So can her decision on this be an issue for the appeals court? Yeah, she didn't care what was argued, she was sending it to the jury. I don't know why I ever hope for a logical and correct decision from her, maybe I just got my hopes up from the Frye decision. Put GZ's mom on the stand. It was GZ screaming. This is so unfair... so WRONG.